It is hard to understand what the makers of Memoirs of 4 were reaching for when they came together to film the project. 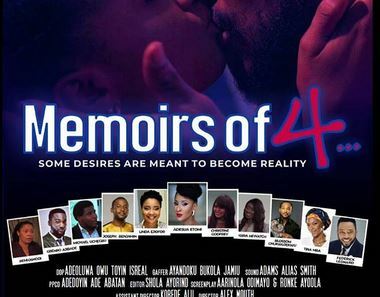 Produced by Aarinola Odimayo and directed by Alex Mouth, Memoirs of 4 cannot quite decide if it wants to be a feature length film or a television series. Memoirs of 4, an exploration of female friendships among adult Nigerian women is certainly shot like a television project. The over-reliance on dialogue, reluctance to get to the point and the multiple points of view stretch the film way beyond its welcome. It runs for a little over two hours but still feels like a lifetime. There is nothing new to see here. If the title, Memoirs of 4 is uninspired, then the film itself is in similar territory. It is an adult drama that wants to explore the realities of growing up through the eyes of four girlfriends who are all getting through this thing called life and not doing a good job at it. Teni (Adesua Etomi) is the de facto leader of the group on account of her fabulous wealth and ability to gather the girls together. She is also a walking cliché; rich, successful single lady who is presents a tough as nails exterior to mask a soft core. She condones no foolery from her subordinates at work, claims to get laid whenever the urge comes upon her, although there is no shred of evidence that points to this. All she needs to help her loosen up of course, according to the film, is the love of a good man. Solape (Kiera Hewatch) is dangerously close to clocking the pivotal age of 40 but has no man to show for it. She does the unthinkable. Miriam (Linda Ejiofor) seems to be living the charmed life. Her marriage- to a handsome, wealthy, globe-trotting hubby- has produced beautiful kids and on the surface, she is living the perfect life. The ladies are reunited with Chika (Christine Godfrey), an old friend who completes the foursome. Chika lives with her mother (Tina Mba, who else?) who cannot bear the thought of having a single daughter of marriageable age at home. It goes without saying that nothing is quite what it seems and everyone is hiding something. The uncovering of these secrets form the basis for the film’s big reveal scenes in the final thirty minutes but before arriving there, the screenplay, credited to Odimayo and Ronke Ayoola takes its sweet time and plays around with scenes where nothing much is going on, just ladies gathering and chatting about men. Nothing wrong with a movie that is thin on plot but at least, have a sense of purpose. The source material is a bore but Alex Mouth’s direction of it is almost detached. He makes no effort to liven up the proceedings and brings zero cinematic excitement to the project, trusting only in his beautiful actors to keep the audience engaged. Hewatch, Etomi and Ejiofor are likeable screen presences but it is hard to do decent work with the material they are presented with. Godfrey, teamed with such experienced actors is out of her league and struggles to keep up with the rest, even while they are all doing sub-par work. The men, Blossom Chukwujekwu, Gbenro Ajibade and Frederick Leonard appear to be cast strictly for their good looks. They all have nothing to do and stick around awkwardly. It is one thing to believe in your film and the necessity of it securing a theatrical release but isn’t it someone’s job somewhere to ensure that certain standards are met?